If you opt for the 420 hp 6.2-liter V8 engine in the 2019 Chevrolet Silverado, it’s likely that you like your trucks with a little bit of performance to go with all that practicality. It’s no surprise then that General Motors offers a cat-back exhaust kit for the 2019 Silverado 6.2L, but you may not know all the details behind this factory-backed upgrade. GM recently released a short little video that features all the details of the kit and also some clips of a 2019 Chevrolet Silverado High Country revving and driving with the exhaust installed (embedded above), which be may of interest to any current or prospective 2019 Silverado 6.2L owners. 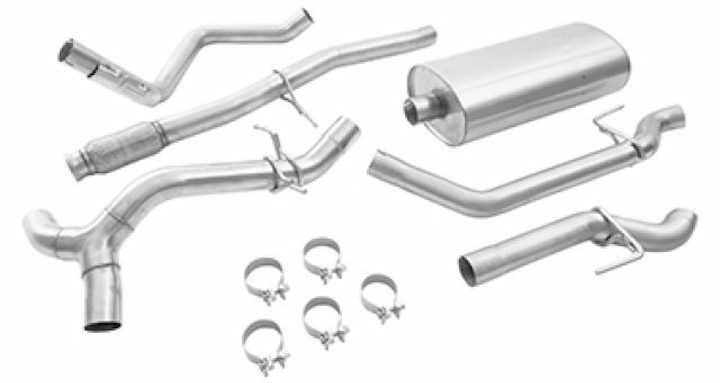 GM says the cat-back exhaust kit features “large front 3.5-inch and rear split 2.75-inch outer-diameter 304 stainless-steel pipes,” along with all the necessary hardware for installing it. The automaker claims a 40 percent reduction in engine back pressure at certain operating temperatures and up to a 13 hp improvement at 5,600 rpm and 8 lb-ft improvement at 4,100 rpm. These are SAE-rated figures as well, so the kit will provide a legitimate improvement in performance – not to mention the louder and more defined exhaust note. Unlike some aftermarket exhausts, the factory kit is emissions legal in all 50 states and will not void GM’s New Vehicle Limited Warranty. The kit is also available for both short and long wheelbase versions of the Silverado, although the truck must be equipped with the optional 6.2L V8 engine. GM also offers such a kit for the 5.3L V8 Silverado, which is available in both single tip and dual exit variants. Other performance upgrades available for the 2019 Silverado include a cold air intake for the 6.2L engine, front and rear brake upgrade kits, a range of Borla exhaust tips in different styles and a lifted suspension kit for 4×4 equipped models. You can view the full list of factory 2019 Silverado performance parts at this link, or click here for the entire 2019 Silverado accessories catalog. Best thing to do, whether you get a kit from GM or go aftermarket, is get a custom tune done as well. A lot of companies like Diablo sell the hand held tuner with preloaded tunes on for various fuel types, 87-89-91 octane, as well as an 87 eco tune. Get the exhaust, headers, intake, whatever affects engine performance. Then within the handheld tuner you your log driving data under certain conditions, send the log back, and then you get a custom tune specific to your truck, or vehicle. You get the most gains out of your performance parts, and also a smarter, more responsive transmission. Not sure why your getting so many down votes without replies to even discuss or contest what you post so I’ll chalk it up to ignorance which seems to be in abundance here at times. AFAIC , your spot on and the only aspect you missed was don’t bother with an exhaust upgrade of ANY kind, brand, manufacturer unless your doing an air intake as well and do the tune afterwards as mentioned below by Travis. This is true for any vehicle as all internal combustion engines are just really air pumps. Any restriction in and/or out inhibits performance and a tune is an absolute MUST or you may end up with an actual reduction in mileage and performance. Another factor is $$ compared to aftermarket and HP gains per dollar as such. Live to dream.. the 2019 GMC tailgate design built as a replacement for all Chevrolet and GMC trucks made in the last 20 years. The illustration shows the kit with tail pipes for a single outlet muffler. Is that correct or does the kit actually have a dual outlet muffler with different tail pipes? In that case the illustration would not be correct. I have a 2019 High Country Z71 4X4 with the 6-1/2 foot bed (so called long bed) and the 6.2 liter V8 with 10-speed transmission. I will buy the kit if has a dual outlet muffler. The custom tune is great but I wouldn’t do it with a brand new one since it will good the warranty. They minimize the torque management, increasing fuel and air mixture, and the good ones are programed to your ECU. Less restricted air intake, the exhaust, and tune three things you do to your truck to maximize the power without adding bolt-ons or messing with the heads. It’s just an extra 22 lbs of steel, if it’s 3.5” inlet it should be 3.5-4” outlet through a single exhaust pipe. It’ll be cheaper, less weight, and more efficient, just a way to sell for more money on a greatly overpriced truck. When you measure the square inch area of the pipes a single oversized pipe will flow more air.